Owners and operators of warehouses who use pallet racking need to ensure the safety of everyone who enters their warehouse, and the best way to achieve this is to have an annual safety inspection as recommended by SEMA – the Storage Equipment Manufacturers Association. Is it a legal requirement to have an annual inspection? No, it is not. However, if you fail to have an annual inspection, or at the very least a bi-annual inspection, you will be going against the advice of the Health and Safety Executive and you could be in serious trouble if someone suffered injury in your warehouse as a result. As a warehouse owner or operator what this means is that you need to ensure that anybody who enters your warehouse – and that means anybody, not just your employees – is safe as far as is “reasonably practicable”. That means using your common sense, and as far as pallet racking is concerned it means that you SHOULD have – not MUST have – your racking inspected on an annual basis as recommended by SEMA. You should also have your racking inspected on a weekly basis by what HSE describes as a “technically competent” member of your staff. This will mean that any damage as a result of accidents will be noted and the appropriate course of action can be taken. It will also flag up any minor repairs which might need to be done such as tightening of fixings that have become loose. An annual racking inspection will be undertaken while your racking is loaded with pallets. Anything that is damaged or faulty is noted and a report supplied based on the SEMA Code of Practice. SEMA has a colour coding system of green, amber, and red. Green means that an item is damaged but is within the SEMA code. The item can continue to be used but should be monitored. Amber means that it is outside the SEMA code, but the rack does not have to be immediately off-loaded. However, when it is off-loaded it should not be used again until the problem has been attended to. Red indicates that the rack is well outside the limits of the SEMA code and it should be off-loaded immediately and not used again until it has been repaired. An annual inspection can also indicate areas where improvements might be made such as installation of barriers in high traffic areas and where safety notices might be added. So, in short it is not a legal requirement to have an annual inspection of your pallet racking, but you could be in trouble if there was an accident, since it could be argued that you did not take reasonable steps to ensure someone’s safety “so far as is reasonably practical”. An annual inspection will usually take less than half a day, and as with many things in life, it is better to be safe than sorry. Click here to book a safety inspection. Do you need rack end load notices and pallet racking safety inspections? Or perhaps you need a pallet racking safety inspection to make sure your racking is safe and free of potentially hazardous damage or defects. Here at 2h Storage we can supply all your pallet racking requirements from pallet racking design, supply and installation of both new and used pallet racking. We can inspect your pallet racking and provide you with an easy to understand and comprehensive pallet racking safety report. This will detail any missing rack end load notices and meet the standards of the most stringent health and safety professionals. We provide a full risk and method statement for our pallet racking safety inspections and provide an easy to follow but comprehensive electronic report within 48hrs of attending site. Health and Safety in the work place is of paramount importance to your business. An Annual Rack Safety Inspection will help you ensure your warehouse is a safe place in which to work. Racks and Shelving are required by law to have regular inspections. Reduce damage and maintenance costs in the future. So for all your pallet racking safety and pallet racking inspection requirements call our warehouse safety team here in Yorkshire on 01937 585 057. Pallet racking safety advice is essential to warehouse managers and those who manage and work in warehouse, distribution, production and manufacturing facilities that use or are buying and designing warehouse pallet racking. Here at 2h Storage we are pallet racking safety experts and we can save you time and money while helping protect your team, products and pallet racking through warehouse racking safety inspections, pallet racking protection, and team pallet racking safety advice and training. If you need pallet racking safety advice from our pallet racking safety team in Yorkshire call 01765 640 160. Those who work in the warehouse industry are aware of the dangers of falling pallets or items falling from stored pallets. This is why all single racks that are not protected by being positioned against a wall must be fitted with pallet racking safety netting and anti collapse mesh The purpose of this mesh is purely to project those working or passing below from being struck by a falling object in the form of a pallet or stock. There are two main types of pallet racking anti collapse mesh the first is in made to measure steel mesh pallets fitted with stand off brackets that is bolted to the rear of the pallet racking. The second type is a nylon mesh that is fitted in larger panels with a wire rope and stand off brackets. The reason for the stand off brackets is to allow for pallet overhang or stock overhang if the mesh is fitted directly to the pallet racking beams it will be used as a back stop by those loading the pallets into the pallet positions on the pallet racking. This simply increases the danger as you may now be faced with not only falling pallets and stock but with falling mesh panels. This is why the standoff brackets are used it is also a reason why some warehouse managers prefer the nylon mesh. Here at 2h Storage we have years of experience in providing the most cost effective and safe solutions for pallet racking so call our design team on 01765 640 160. Although failure of pallet racking and accidents are rare when they do happen the results can be devastating from both a human and business perspective. The main causes for failure are impact from forklift trucks, with overloading and abuse the second largest cause of failure arguably the third being the culture of the business and its employees to racking and rack safety. 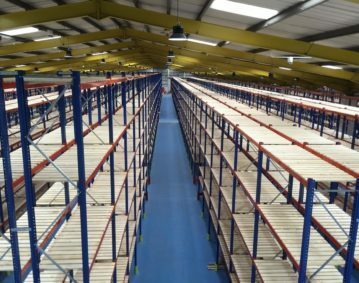 Two on the most key points are the correct initial design and specification and the correct experience and training of those who are to use the racking. A good tip is to create a file on the racking that contains all the relevant data on design, inspections and training. Make sure that a copy is kept in the racking and all those operating in and around the racking have familiarised themselves with its content. This will also help you enforce capacity and loading within the pallet racking’s safe operational limits.